← Can You Spare a Few Minutes? 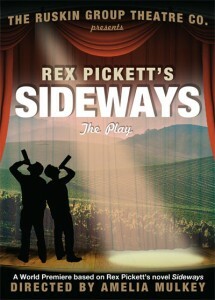 Just read on Rex Pickett’s blog that he is planning to write another Sideways novel — the last in the “trilogy” apparently — that should take place in Chile. Pretty cool news. He came out with Vertical last year (maybe late 2010?) — actually this particular post is a (rather long) explanation as to why you shouldn’t expect to see Vertical the movie at your local cinema anytime soon. His own stage adaptation is running right now until July 22 to sold-out shows. I liked both novels, and it’s been no secret that Sideways in particular (novel and movie) has been a huge influence on the novel I’m writing right now. I just hope I can have mine finished before Rex pumps out his latest… I mean, wouldn’t it be depressing if I don’t? This entry was posted in OTF and tagged a few strong words, Graham Strong, novel writing blog, Rex Pickett, Sideways, Vertical. Bookmark the permalink. I couldn’t take it any longer; I just bought a copy of Vertical (a B&N ebook). As a big fan of the movie, I’m interested in seeing what comes next. Pickett’s “in a nutshell” post is anything but, yet to see Hollywood’s gears turning (and jamming) is at least interesting. Hollywood is willing to cannibalize board board games for movie ideas, so you’d think a sequel to a relatively low-cost hit would be a no-brainer. That said, the original director’s unwillingness to support a sequel — either by himself or even by another director — smells a little odd. Why would you put the brakes on someone else’s career? Especially if you’re not interested in helping. Ah well. Probably more going on here than we know. TC/Writer Underground’s most recent blog post: No Posts Were Found! I’d recommending reading the first book too – although the movie is a fairly good representation of it, there are some key differences, especially with regards to characterization. Worth a look. I’m really of mixed minds about a sequel. On the surface, yeah, I’d love to see it. But rarely do sequels capture the same magic. I have to say I struggled with Vertical; I’ve never finished any book cluttered with that many adjectives and adverbs (and never a short when a longer one could be found). Heavily written and just not my style at all. Of course there isn’t; my voice drowns out all others in matters of taste, style and syntax. I’ve read both books and rate Sideways the movie as one of my favourites ever so as you can imagine I’m a little peed that Vertical might not make it to the big screen. I’ve not problem with Payne not wanting to direct the sequel (think Lost World vs Jurassic Park for Spielberg) but there are plenty of intelligent young directors out there who could use the cast and direct in Payne’s style a little or go in a direction of their own. Why not bring Sofia Copolla on perhaps or Sam Jaeger, whose Take Me Home nailed a good road trip movie in Take Me Home? Why not? Rex Pickett had a long post on his blog about why Vertical likely won’t become a movie. It’s since gone (not sure why, though he tends to wear his heart on his sleeve — maybe somebody got miffed?) but there is still a YouTube video about it. Basically, it comes down to rights and intellectual property and all that. Love to see it myself, but then sequels rarely live up to their hype. Maybe we’re better off not seeing it anyway. In any case, welcome to the blog!